Just last week I attended a “Blogger Bash Happy Hour’” at the Kendra Scott jewelry store in Austin. 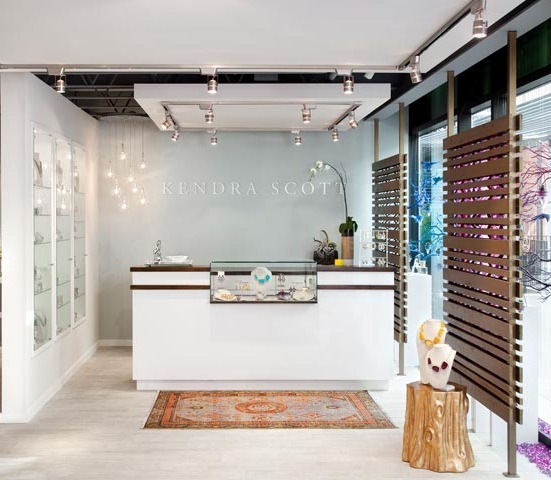 Kendra Scott has set a great example of someone who not only has stylish fashion sense (clothes, jewelry) but also translates her style into her corporate office and personal home. 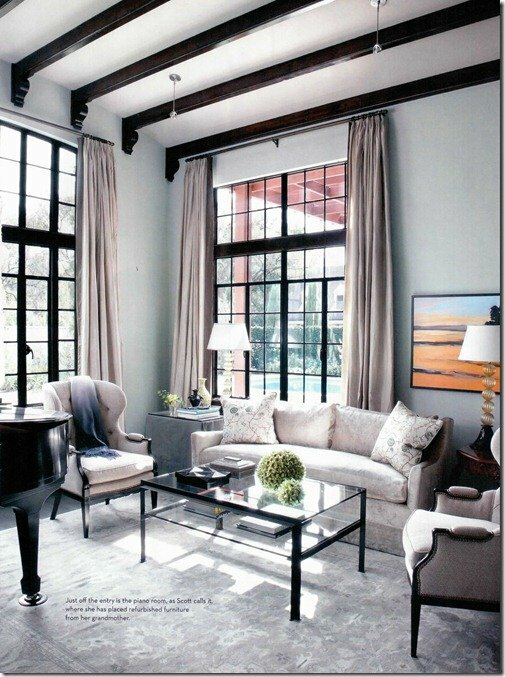 Many people have no trouble sourcing fashion to wear, but think it is not as important to furnish their home and workspace to reflect their own creativity. This is simply not the case. If the space you live and work is furnished to your taste, you will be much happier, more comfortable and more creative with your time spent there. 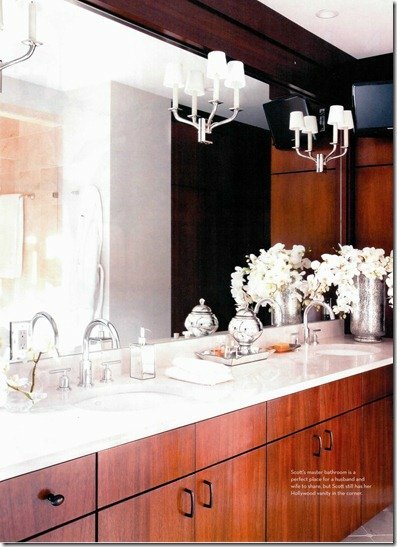 This is a mantra we live by Heather Scott Home & Design, dressing your space to suit your style it is just as important as dressing your body. 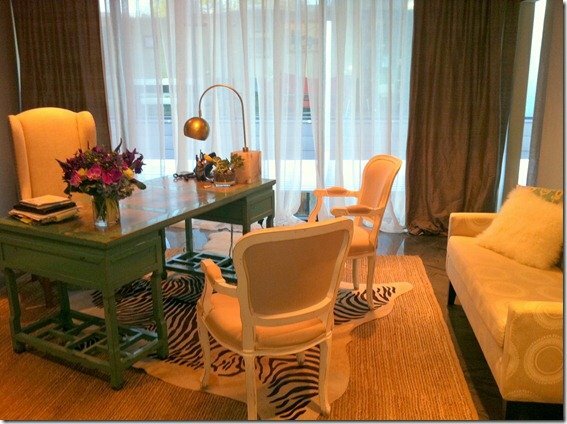 And, just as we do, you can see how Kendra has mixed high and low design items in her space. You don’t have to spend a fortune on all high end items to reflect your personality, but you do need to have a vision, or you need to hire help to craft one. I am going to take you on a little tour of Kendra Scott’s jewelry, office and home to see how she has implemented her personal style in 3 unique areas of her life. 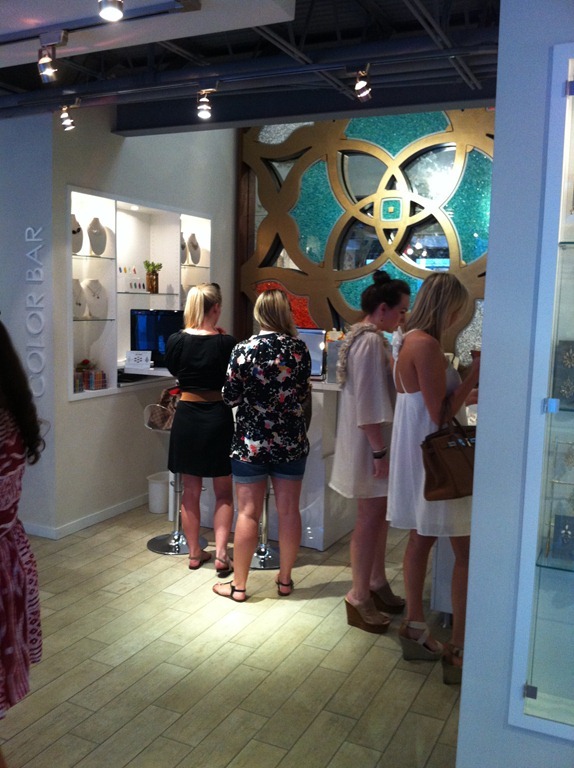 Kendra Scott’s jewelry is quite well known, especially among celebrities. 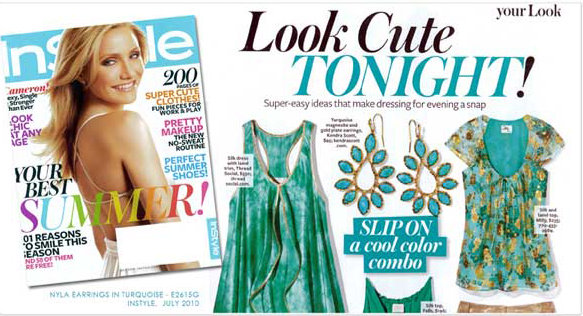 It is very stylish, but also quite affordable (you can find it nationally at stores like Nordstrom or Henri Bendel). 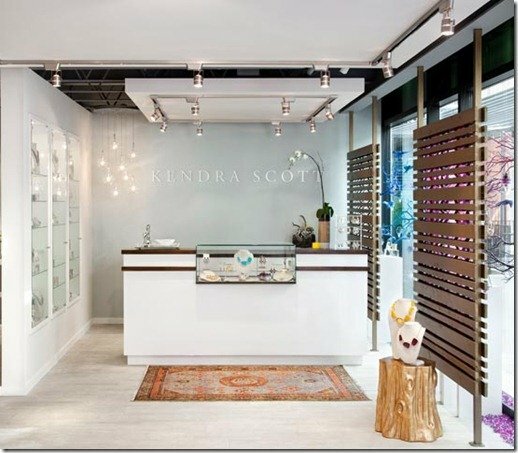 Kendra opened her first retail store boutique in Austin last year. The store is just like her jewelry: fresh and fun. Her team is in the process of opening their second location, in Beverly Hills. The store opens in just a few days, on August 13th. 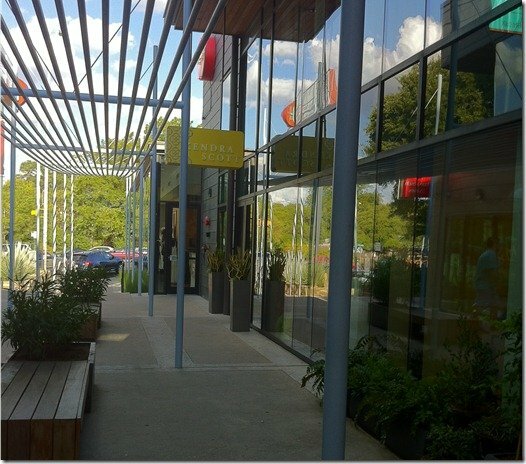 While I was at the bash I was able to get a tour of the retail store (downstairs) and the corporate offices (upstairs). The first picture below is of the “Color Bar” where you can customize your jewelry. This is a big hit for wedding parties. 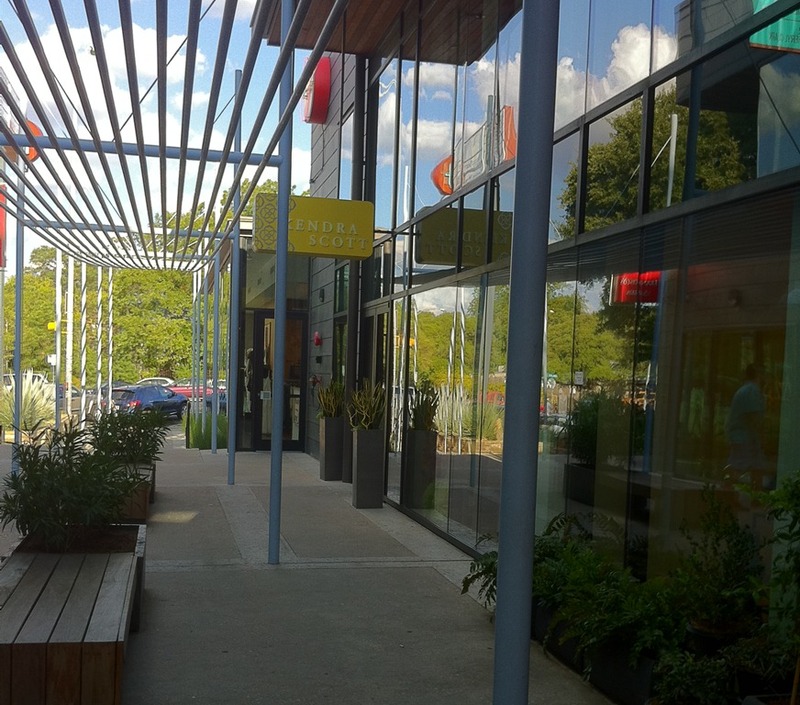 The corporate office lobby has several furniture and décor pieces from West Elm and Four Hands. 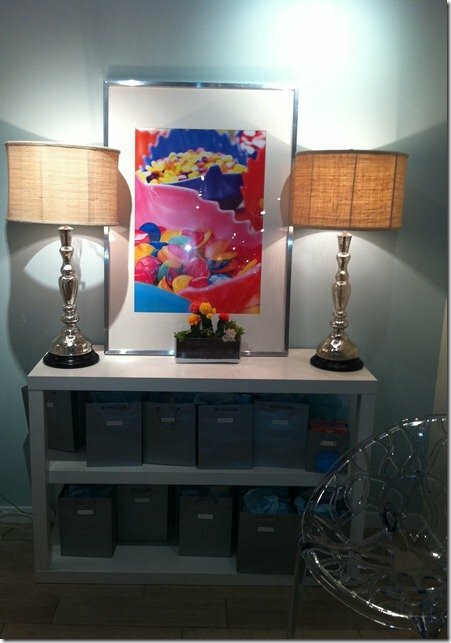 For wall décor, they have framed in plexiglass the magazine articles where their product has been featured. This is a great way to showcase a photo gallery but still keep it clean and pleasing to the eye. 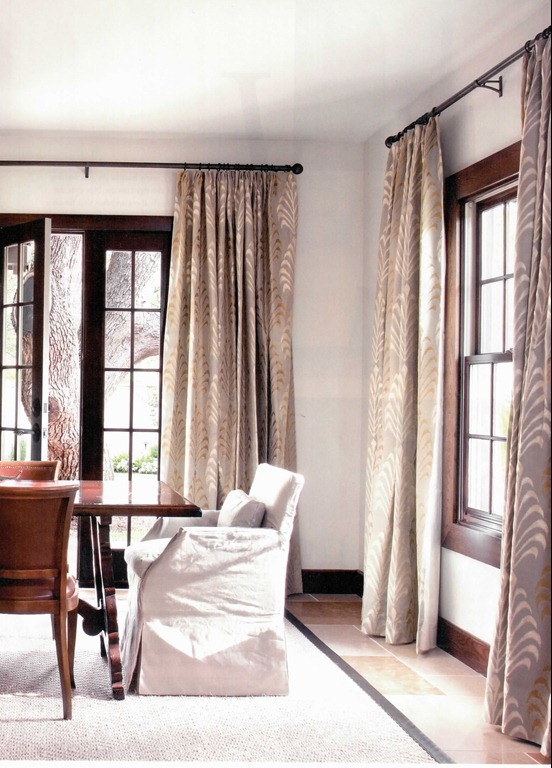 Not long after moving to Austin, Kendra Scott’s home was featured in the Austin Monthly Home magazine. I loved the issue so much, I’ve keep it for several years. 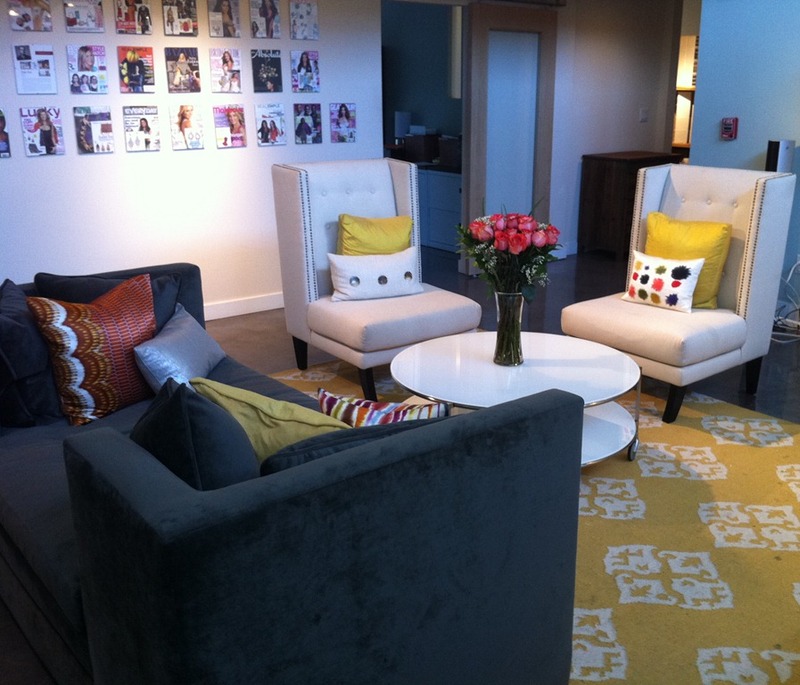 Having seen Kendra’s cool, office style, you now have the chance to see her home! 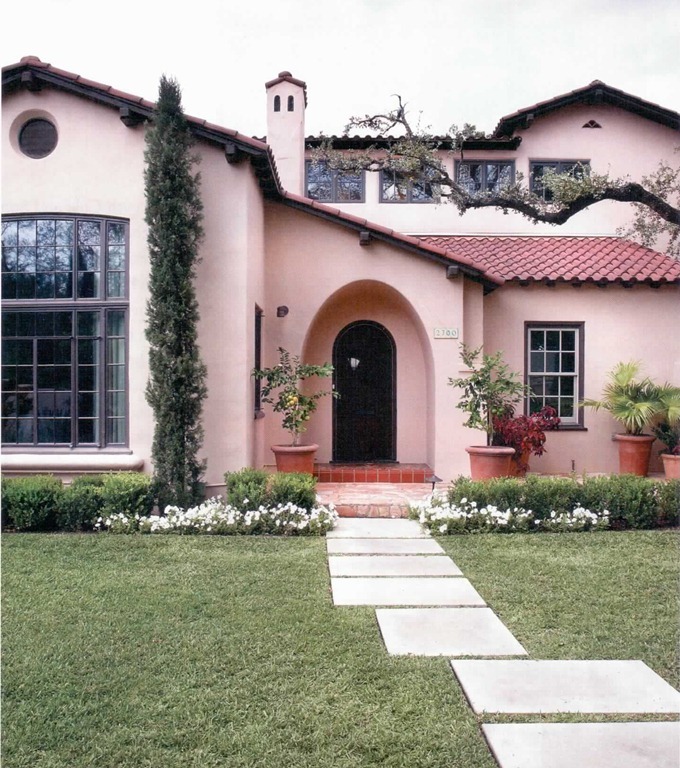 Kendra’s home is located in the popular Pemberton Heights area of Austin, which, according to the neighborhood association, was named by Town & Country magazine one of the 25 Platinum Addresses in the United States. The area is filled with homes from the 1940’s loaded with charm and character. 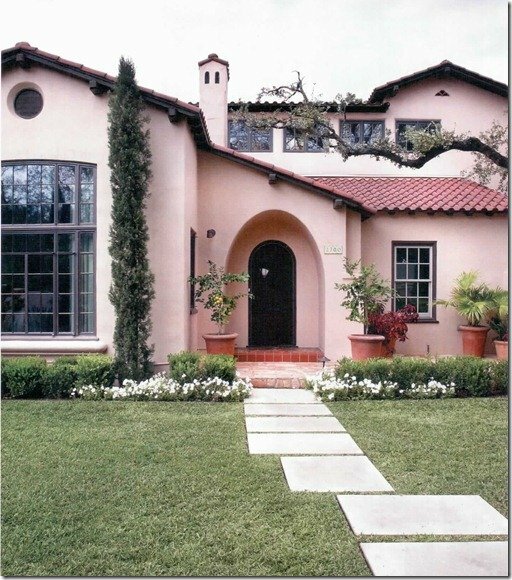 Kendra’s home is a Spanish Colonial/Mission Revival which is approximately 90 years old. 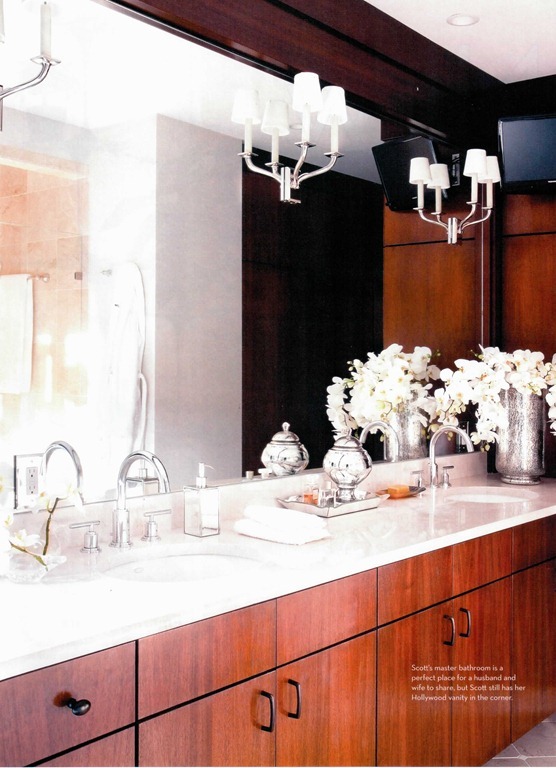 Kendra had dreamed of “retro Hollywood estate” and hired local designer, Mark Ashby, to implement her vision. The home features a number of antiques as well as many items sourced from some of my favorite shops in Houston. The dining room features a vintage Murano chandelier from Vieux in Houston, art by Elizabeth Chandler and head chairs from Shabby Slips. 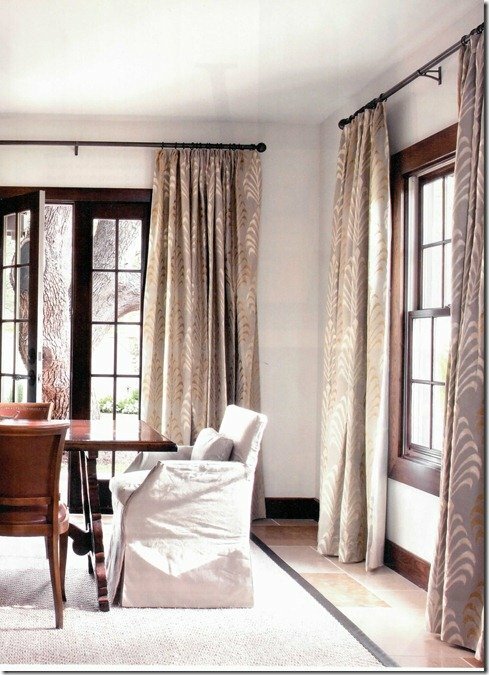 The sisal rug is by Merida, one of the lines we carry. 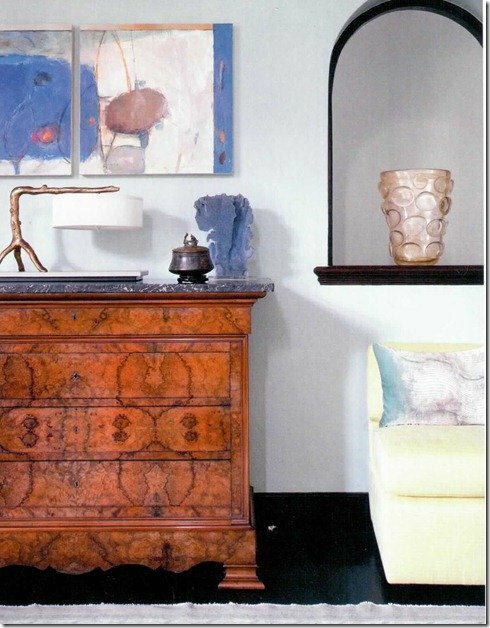 The “Paino Room” is decorated with furniture from Scott’s grandmother, which she had refurbished. Located in the front area of the home, this room has ebony floors and architectural arches that may have originally been windows. 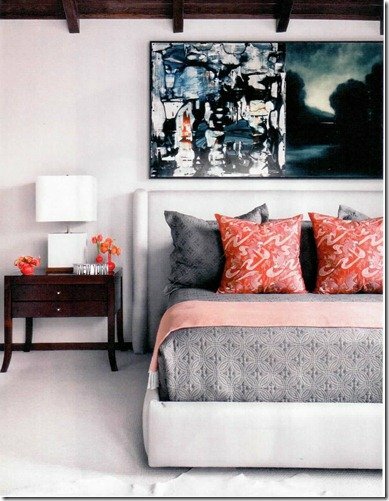 Coral from Found and velvet pillows from Area, both with stores in Houston. Kitchen, with photo of Kendra Scott- very modern relative to the rest of the home. Master bedroom with bedding that appears to be from Peacock Alley. 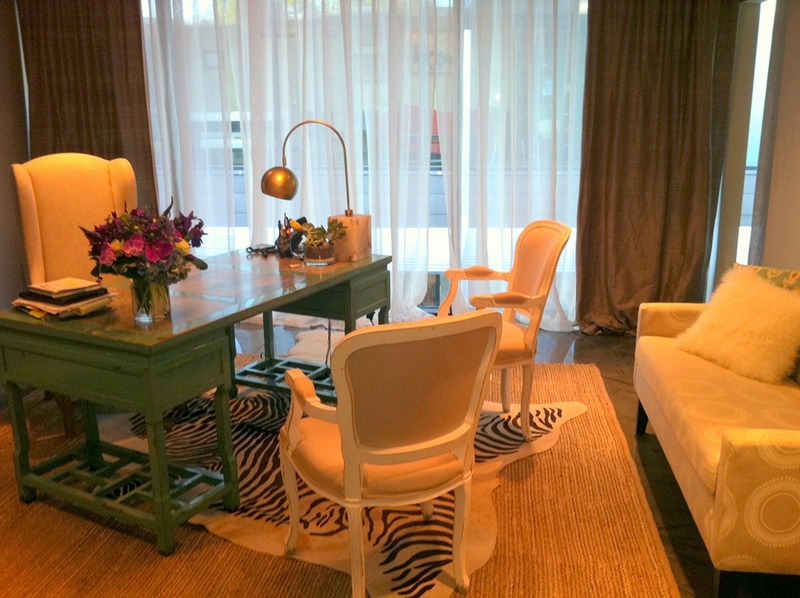 I hoped you enjoyed seeing Kendra Scott’s home as much as I did the first time I saw it! Her store is great fun and I highly recommend popping in to check out the jewelry in person. Imagine your life if, like Kendra, you carefully edited your style and implemented it in your clothes, home and work. You would probably end up buying fewer ‘things’, but the things you did acquire you would keep longer and get more joy from, enhancing your total environment. Something to keep in mind and challenge yourself with this year!